This home has such a peaceful and secluded setting with amazing privacy, great snow plays areas, and is fully furnished and equipped, making it the perfect choice for your next Big Bear mountain vacation. "FREE WiFi"
Cozy Bear Cabin- After a day of activities in the mountains, on the lake, or at one of the local ski resorts, come back to enjoy the peace, serenity, and natural beauty of Big Bear Lake and the surrounding mountains in this 3 bed 2 bath home! "FREE WIFI"
This wonderful log style cabin is perfect for a great relaxing getaway! "FREE WiFi"
Great Family Cabin like new inside and out, wood beam ceilings, open living space with wonderful river rock corner fireplace, lots of light, delightful kitchen, dining table seats 6, decks with outdoor dining, barbecue, relaxing Spa. 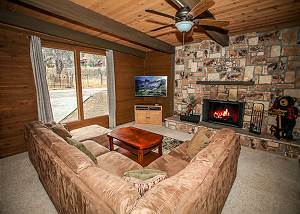 "FREE WIFI"
Slope Side Retreat- is just steps from Bear Mountain Ski Resort. This property has 3 bedroom plus loft and 2 baths. Walk across the street to Bear Mountain with a pool table for your enjoyment. Electric/ Hybrid car charging port available. "FREE WiFi"
A mountain vacation home for the whole family. This charming cabin is sure to please everyone with vaulted ceiling, open floor plan, all the amenities you're looking for! A fireplace and an awesome Spa on the deck high among the trees! "FREE WiFi"
Summit Bear is a 4 bedroom, 3 bathroom home is a perfect retreat for walking to the slopes at Snow Summit. Great 2 story retreat for 11 people. "FREE WiFi"